Durian fruit, nicknamed “the king of fruits” in Southeast Asia, is very nutritious. More so than many other fruits. It’s just a shame it has such a bad reputation due to its extraordinary strong smell. Due to this bad smell, the fruit has even been banned from the Singapore Rapid Mass Transit and hotels. A group of scientists from the German Research Centre for Food Chemistry has conducted a study to try and figure out why this fruit produces such a strong awful smell. 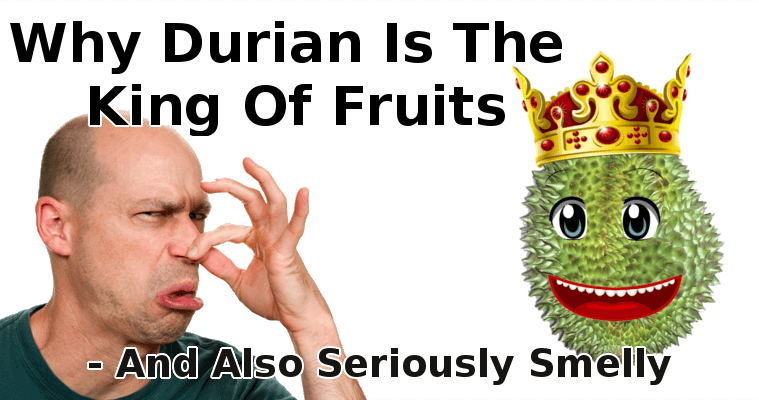 They used a Thai durian and found that the smell is not from just a single compound. It’s due to a mixture of 19 different chemicals. However, none of the compounds match the smell of the durian directly. They all have a wide range of smells, but it’s when mixed together that they produce that awful distinctive smell of the fruit. But it was two in particular that really conjured up that rotten smell — ethyl (2S)-2-methylbutanoate which has fruity components and 1-(ethylsulfanyl)ethanethiol which is more onion based. The durian fruit is used in both savory and sweet dishes. It has a creamy flesh and seeds which can also be eaten. Some have likened the taste to a weird mix of cheese, almonds, garlic, and caramel. People have used durian fruit for juices, roasting or boiling, in soups or as a vegetable side dish. It’s even used for ice creams and desserts. It’s a very versatile fruit! The durian tree is tropical and belongs to the Malvaceae family. With relatives including okra, cocoa, hibiscus, and cotton. It is native to the Brunei, Indonesia and Malaysian rainforests. Out of the 30 species of Durio tree in existence, only 9 of them are known to produce edible fruit. They are thought to grow up to 50 meters. The durian is seasonal and grows from June – August. It is known for its large size, unique odor and a thorn covered husk. Durian typically weighs in at between 1-4kg. Like the banana it is high in energy, minerals, and vitamins. An average fruit is around 147 calories. Although the durian contains more fats than other fruits it is the healthy fats, and is free from saturated fats and cholesterol. It is rich in dietary fiber. It also helps eliminate cancer causing chemicals from the gut. Contains about 33% RDA of vitamin C.
It also contains good amounts of minerals such as manganese, copper, iron, and magnesium. Also, has high levels of essential amino acids. Durian plants have been used in traditional medicine in Malaysia to help treat illnesses such as high fever, jaundice and skin conditions. It is thought to reduce cancer risk, this is due to the antioxidants it contains. Help prevent heart disease. Durian contains compounds which can help lower cholesterol levels and decrease the risk of hardening of the arteries. The rind of the durian contains antibacterial and anti-yeast properties which can help to fight infections. Durian can prevent some glucose from being absorbed and stimulate insulin to be released which leads to a lower blood sugar. Interestingly the name of the durian fruit actually dervices from a Malay-Indonesian word for ‘spike’. The word ‘duri’ refers to the spiky outer shell of the fruit. Love It Or Hate – It Is An Interesting Fruit! The durian is a fruit which you either love or hate. Yes there is a very powerful awful smell from this fruit, which has been likened to “turpentine and onions garnished with a gym sock”. The taste, however, is very different from the smell. Some people state it tastes like “sugar cream or creme brulee but with more personality”. So if you can get past the smell then you will probably enjoy this fruit which also has many potential health benefits. It is worth giving it a try if you get the chance – even if only once! If you do decide to give this fruit a go then try mixing the flesh with a little sugar and wrap it in a pancake. You could also try it wrapped in rice paper and deep fried. It is a strange fruit indeed, but life is all the richer for having the durian in it.